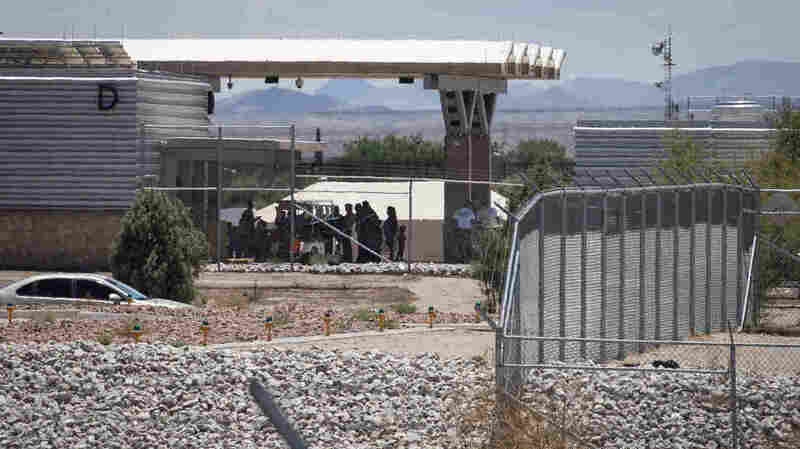 Tent City Housing Migrant Children To Close As Kids Are Released To Sponsors The Department of Health and Human Services confirms the population at Tornillo, Texas, is down from nearly 3,000 adolescents last month to about 1,500. The camp is due to close at the end of January. People wait outside the port of entry at Tornillo, Texas, in June 2018. Beyond them is one of the tents that were put up to house unaccompanied migrant children. A controversial, government-contracted shelter for migrant children in the West Texas desert will shut down later this month, a result of sweeping changes to the rules that govern the custody of youngsters. Nationwide, the number of children in the government's care has stopped growing and begun to fall. In the last two weeks, some 2,200 child migrants — mostly teenage boys from Central America — have been discharged from shelters and allowed to join family already in the U.S.
At the biggest shelter of them all — the tent city in Tornillo, Texas — they're driving more than a hundred kids a day to the El Paso airport, to go be with their adult sponsors, said a senior official at the camp who asked not to be named because he wasn't authorized to speak to reporters. "We all feel a sense of relief," said the shelter official. He said he expects all of the children will be discharged by Jan. 15. BCFS, the San Antonio nonprofit that runs the sprawling camp, plans to vacate the bleak acreage by Jan. 31, when its contract runs out. They've already begun to demobilize. "I noticed one of the large tents being taken down, and as of yesterday another large tent is being taken down," said Joshua Rubin. He's a Brooklyn software developer turned immigrant activist who has been staying in an RV just outside the Tornillo gate. On his Facebook page, Witness: Tornillo, Rubin has posted photos of the shrinking tent city. "I've noticed a lot of bathroom trailers rolling out of there. They've rolled out dozens of mobile offices. And I see vans full of kids heading out. These are all really hopeful signs." HHS announced an abrupt rule change on Dec 18. The agency dropped a requirement that everyone in a sponsor's household had to be fingerprinted and receive a criminal background check. That extra vetting slowed the discharge process. Now, only the adult sponsors are screened. "The children should be home with their parents. The government makes lousy parents," Lynn Johnson, HHS assistant secretary of the Administration for Children and Families, told NPR at the time. "If, in fact, the government is interested in releasing kids to sponsors in a more timely manner, there should be no reason for them to be expanding the beds at Homestead," said Dr. Amy Cohen, a child psychologist in Los Angeles who works with migrant children. HHS confirms that that a "temporary influx facility" built in a vacant Job Corps center in Homestead, Fla., is being expanded from 1,350 beds to 2,350 beds, beginning in mid-January. The shelter system still struggles to handle the continuing surge of migrant children. Customs and Border Protection reports that in November, an average of 176 "unaccompanied alien children" arrived daily at the Southwest border, and were taken into custody.